← A small country does very well indeed. On my way back from a trip to the Teifi Marshes, just in Pembrokeshire, at the weekend, I stopped off at a National Trust property near Aberaeron where I spent some time photographing wild daffodils and snowdrops on the river bank. At lunch time I bought myself a sandwich at the riverside cafe . Two men sitting at a table caught my eye. I know you, one said, you’re Jeremy Moore, aren’t you? “Erm….yes…..but I’m sorry I don’t recognise you…..” Ah, we both know who you are but you don’t know either of us!” That’s right, I said, somewhat bemused. “It’s the great Jeremy Moore,” the man said, “I’ve got two of your books!” This was quite a surprise, but not an unwelcome one, as I had been feeling in need of a little boost to my self-esteem. His tongue was so far in his cheek, I suspected, that I was surprised I could understand a word he was saying. Then he introduced himself. His name was John and he was an anti-windfarm campaigner. He reminded me that he had accosted me in an Aberystwyth cafe one day and been critical of my pro-windfarm stance. For my part I remembered the episode and how annoyed I had been. On Sunday he suggested that I must have changed my mind on the subject of windfarms but in fact I haven’t; I’ve never felt comfortable about wind turbines in the landscape but they don’t send me in to paroxisms of indignation every time one comes into view. We all use electricity. Wind turbines remind us of the uncomfortable fact that it has to come from somewhere, and we don’t like it. About ten years ago I had an exhibition at MOMA Wales, a lovely little gallery in Machynlleth, Powys. 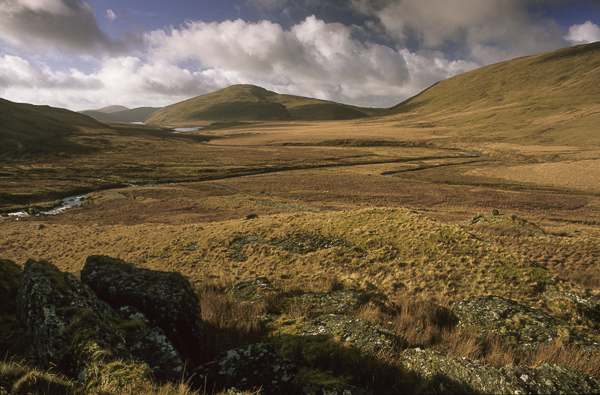 The subject matter was a small area of land high up in the Rheidol valley – ‘wild Wales’ if ever it existed anywhere. The Battle of Hyddgen had taken place there over six hundred years ago. During my research for the exhibition I came across a poem by the great Welsh priest/poet R.S. Thomas, who had felt the weight of the ages while in this place. With the permission of his son, I reproduced the poem and framed it alongside the images in the exhibition. Shortly afterwards the hilltops surrounding Hyddgen had been proposed for a windfarm, the biggest in Wales. John had taken a group of anti’s up to Hyddgen and recited the poem, which he believed I had written. So not only, in his estimation, was I a notable anti-windfarm personality but was also poet of great wisdom and insight! No wonder he thought I must have changed my mind. For the record, the windfarm has not yet been built, partly thanks to a concerted campaign by the anti’s. There is more doubt now than ever that the thing will go ahead, but if it does, we will be able to see part of it from our house. But if I were ever able to bounce a grandchild on my knee and answer the question “Grandad, what did you do about climate change?” I wouldn’t like to have to say “I campaigned against wind turbines in the Welsh hills”. This entry was posted in Uncategorized and tagged climate change, hyddgen, mid-wales, mistaken identity, MOMA Wales, wales, Wild Wales, windfarms. Bookmark the permalink.